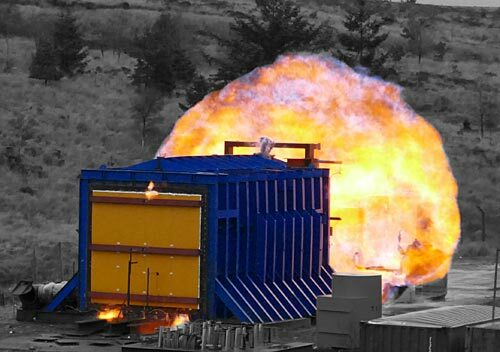 InterDam, supplier of fire and blast doors, walls and windows to the offshore oil and gas and renewable sectors, is in the final stages of testing a new pre-fabricated fire and blast resistant panel. Called the Generation V, this new product comes hot on the heels of the company’s Generation IV fire-resistant sandwich wall system developed in response to the industry’s desire for using fully fit-for-purpose prefabricated walls that fit modular and standardized building designs. “Our customers are very concerned with safety,” says InterDam’s Managing Director Berend Groeneveld. “At the same time, they want to lower CAPEX through the modularization and standardisation of project designs so we’re pushing the boundaries of engineering to help them achieve these objectives,” he continues. InterDam has tweaked the panels’ insulation material by realigning the layers of fibres and optimizing the panel support structure to absorb more energy. This new concept was field tested last November using three sample positions. These tests included damaging the panels to study their breaking point, and proving that they are gas-tight after a blast pressure of 0.8 bar. Finite Element Modelling (FEM) enables InterDam to optimize the design of any blast or fire wall, based on customer project-specific required ratings. Further testing will be carried out later this month at a specialist fire test laboratory in the UK where one of the 0.25 bar blast-tested samples will be tested in a hydrocarbon fire to determine the wall’s post-blast fire resistance. “After all, our mission is to keep people and equipment safe, and our operating philosophy is ‘How safe can you be?". So we’re putting our money where our mouth is,” he adds.